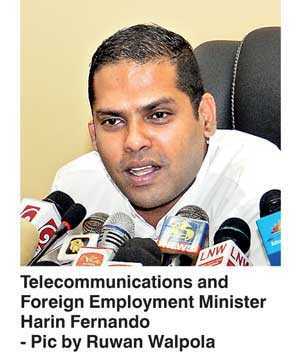 Determined to weed out malpractices rampant in the Sri Lanka Foreign Employment Bureau, Minister Harin Fernando yesterday said that a new agency rating system will be introduced to identify rogue agents engaged in human trafficking. “There are some agents who are engaged in human trafficking. In the recent visit I made to Oman and a few other Middle East countries, I even met a girl who was taken on a visitor visa when she was just 13. She was assigned to work as a housemaid, and visa was changed in Dubai. She was taken by car to Oman, where she worked. The girl, now 16, is in the Sri Lankan Embassy’s custody, where she has tried committing suicide twice,” Fernando said, relating one case of human trafficking uncovered by the SLFEB. To ensure such rogue agents are no longer in the system, the SLFEB plans to reintroduce an agency rating system, which was last done in 2014. Unlike in the past, when the system was fraudulently manipulated to give high ratings to agents favoured by officials in the Bureau, an independent body is to be tasked with carrying out the assessment, the Minister said. Fernando, who was on a “surprise visit” to the SLFEB to observe its operations and identify gaps and bottle necks in the system, said that action will be taken to revive the organisation. “I have given them (officials) instructions on several things, but nothing has happened: that is why I came for a visit here to see what they are doing,” he claimed, saying that action will be taken to auction out idling vehicles in the Bureau. He also said that steps will be taken to ensure that the 24 hour call centre, which is at present handled by only three people, is better managed, with adequate staff. Further, an electronic platform will be introduced to manage foreign job orders, to ensure no fraudulent practices take place in the future. The Minister also said that the discriminatory Family Background Report (FBR) will remain, but will be revised as per recommendations given by the five member Cabinet Sub-Committee. All migrant women registering with the SLFEB are required to file a FBR, including marital status and details of children if any, and caregiving arrangements for the duration of her assignment. The Minister admitted that the policy implemented by the SLFEB, which prevents only migrant women with children under five going abroad, violates labour rights based on gender, and said it should be extended to men as well. “This is an issue that has been raised by many international rights organisations as well. I agree, as there are many instances where fathers have travelled abroad and abandoned the family, leaving the mother and children helpless back in Sri Lanka,” he said. Fernando, however, claimed that the policy has also led to a lot of abuse and malpractices, where migrant workers are devising new ways to bypass the regulation. The policy has led to women leaving the country for work on visitor visas, without registration in the Bureau, to avoid filing the FBR. Further, this has also led to abusive situations as well, the Minister admitted. “We will be taking all this into consideration when we discuss the issue. The discussion to revise the FBR is with good intentions, to ensure that the women are not victimised,” he explained.